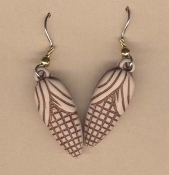 Funky CORN on COBB EARRINGS - Thanksgiving Autumn Native-American Cob Vegetable Charm Novelty Costume Jewelry - Fall Harvest Colors Indian Summer Faux Clay Bone antiqued plastic charms, approx. 1-1/8-inch (2.81cm) long. Great Halloween Scarecrow festival jewelry!